Some people are just brilliant at all they do in life and work – they glide effortlessly onwards and upwards, always knowing the right things to do and say in all the right situations. They are happy in life and successful in their jobs. But how do they manage it? The answer is simple... They know The Rules. 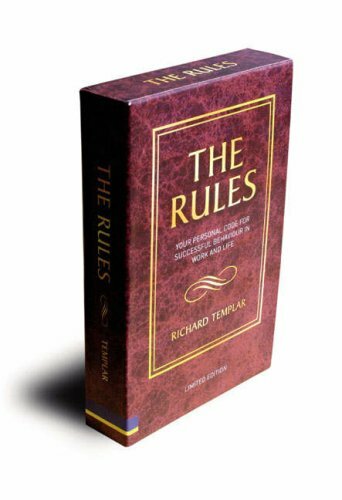 This limited edition boxed set brings together the two international bestsellers: The Rules of Life and The Rules of Work. Written in Templar’s inimitable wry style, you will discover the secret behaviours that separate the successful from the not so successful, helping you achieve more and be more in your work and in your life. Sometimes life works better if you think inside the box. Richard Templar is the author of the international bestselling Rules Series, which includes The Rules of Life, Work, and Management. And coming soon... The Rules of Wealth.